CHARLOTTE – One new team, as well as one familiar one, took home team titles at the NCAA Division II Outdoor Track & Field Championships at the Irwin Belk Complex at the conclusion of the meet on Saturday. The men of Texas A&M-Kingsville won the program’s first-ever outdoor team title, while the Lincoln (Mo.) women brought home its first outdoor championship since 2014. The Javelina, which finished second in 2016, held a commanding lead in the action on Saturday heading down the stretch. With 65 points and a 15-point lead over Tiffin moving into the final event, the Javelina could sit back and enjoy the title, as it did not field a team in the men’s 4×400. Texas A&M-Kingsville benefitted greatly from four event titles. The 4×100 relay squad finished first with a time of 39.71, while Javier Lopez won the 110 hurdles (13.71), Charles Greaves captured the triple jump title (16.08m/52-9¼) and Richard Cervantes took home the shot put title (19.12m/62-8¾). Finishing second was Ashland with 51 points, followed by Tiffin (50), Saint Augustine’s (42) and Grand Valley State (39). Lincoln (Mo.) also took the route of Texas A&M-Kingsville, notching enough points that the outcome of the final event did not factor into its title. The Blue Tigers scored a total of 60, but had 54 heading into the women’s 4×400, which was 12.5 more than Angelo State’s total. The Blue Tigers’ 4×100 relay team won a title with a time of 44.51, as did Rene Medley in the 200 (23.22) and Diana Cauldwell in the triple jump (13.16m/43-2¼). Cauldwell just missed a triple jump title a season ago by two inches. 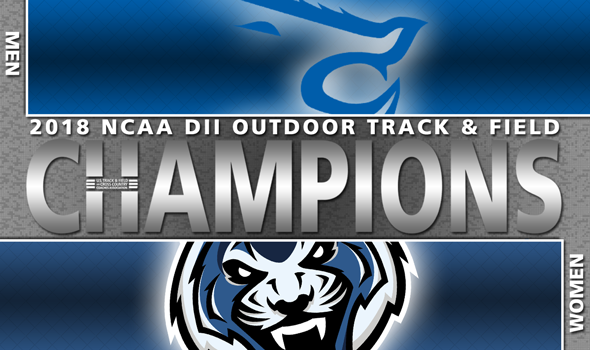 The title is the eighth for the Blue Tigers’ women’s outdoor program, as it also won championships in 2003, 2004, 2005, 2006, 2007, 2009 and 2014. Saint Augustine’s finished second with a total of 48.6 points, while Angelo State (42.5), Grand Valley State (39.5) and Adams State (39) rounded out the top-five. See below for daily recaps of each day of the NCAA Division II Outdoor Track & Field Championships. Quite a few athletes brought home their second-straight outdoor championships during the final day of competition, while a handful of top-10 NCAA Division II performances were recorded. Coker’s Darroneshia Lott won the program’s first NCAA Division II women’s outdoor title, and she did so in grand fashion. The senior won the 800 with a time of 2:01.36, breaking the previous record of 2:02.39 set by Carsyn Koch just two seasons ago. Western State’s Thomas Staines also set a meet record in the 800, posting a time of 1:46.56 to surpass the previous record of 1:46.56 set by Truman State’s Dan Futrell in 1979. Staines’ time puts him fourth in NCAA Division II history. Ashland’s Myles Pringle ran the 10th-fastest time in NCAA Division II history in the 400 with a finish of 45.35, which doubled as the fastest time at the championships since Josh Scott ran a 45.11 in 2010. A familiar face in Mobolade Ajomale from Academy of Art also had an impressive day. He repeated in the 100 with a time of 10.18. He then went out and won the 200 with a time of 20.45, which is good for the eighth-fastest time in NCAA Division II outdoor history. The product from Canada became the first athlete to double up in the 100 and 200 since Minnesota State’s Emmanuel Matadi in 2015. David Ribich of Western Oregon also doubled his 1500-meter title total with a win on Saturday. The senior notched a time of 3:45.34 for the program’s third men’s outdoor title in history. Angelo State’s Nils Fischer picked up his second-consecutive javelin title early in the day with a toss of 75.19m (246-8). He became the first athlete to win back-to-back javelin championships since Nick Howe did so for UC San Diego in 2010 and 2011. Alaska Anchorage’s Caroline Kurgat won her second of two titles during the final day of action, winning the 5000 with a finish of 16:22.62. Kurgat’s two titles (see Day One Recap below) bumped the Seawolves program’s total to six. Sarah Berger of Walsh and Landon Huslig of Oklahoma Christian also made history for their programs. Berger won the program’s first-ever NCAA Division II women’s outdoor championship, as she claimed the 1500 title with a time of 4:22.22. Huslig won Oklahoma Christian’s first-ever title with a 400-meter hurdle championship, posting a time of 49.67. A pair of record performances highlighted the second day of the meet. Western State’s Alicja Konieczek took home her second-straight steeplechase title with a time of 9:47.72, breaking her own NCAA Division II record in the event. The product from Poland now owns three of the top-four marks in NCAA Division II history. The multi events kicked off the day, with Texas A&M-Commerce’s Florian Obst winning his second-straight decathlon title with a total of 8,005 points. Obst became the first decathlete to score over 8,000 points at the NCAA Division II Outdoor Championships since 1985. His point total ranks as the third most in NCAA Division II history. Angelo State’s Kami Norton won the heptathlon with 5,336 points after falling just under 200 points shy of winning the title a season ago. A pair of women made it a back-to-back affair on the opening day of the meet. Michaela Dendinger of Wayne State (Neb.) won her second-consecutive shot put title with a toss of 64.70m (212-3). Fatim Affessi added another long jump title to her trophy case after winning the same title a season ago. The product from West Texas A&M notched a leap of 6.32m (20-9). Tiffin’s James Ngandu also captured the 10,000-meter title with a time of 29:19.91 after finishing second a season ago. Kurgat of Alaska Anchorage won the first of her two titles of the weekend, taking home the 10,000-meter championship with a time of 34:13.80.